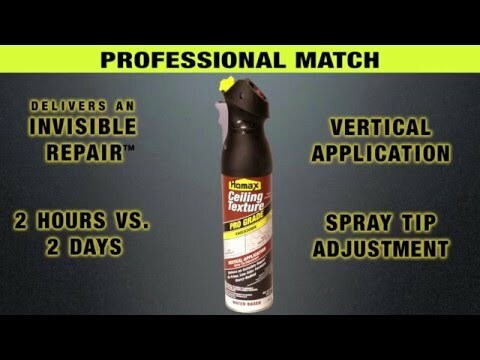 Jefff I bought this for a couple repair spots on my ceiling thinking it would do the trick. For the few seconds it sprayed it was great. It stopped spraying after a few seconds and just dribbled. Lots of shaking later and I got a few more seconds of spray. Based on the other reviews this just seems like a poorly designed product and is extremely frustrating. I'd like to find out what quality control is used. MJaram Bought The Ceiling Texture Used It Once, Went Back To Use It Again And It Will NOT Spray. Jenn D I just bought to add texture to my wall. I sprayed a 3x3 foot area and I put the can down to smooth it. When I picked it back up to continue, the nozzle stopped working. I'm not impressed and will be returning it to Home Depot tomorrow. Homax® Pro Grade Ceiling Texture technology is the latest innovation in ceiling aerosol textures. This professional tool features adjustment of pattern and vertical spray tip for ceiling application. The patented adjustable nozzle allows you to match your existing ceiling texture. The heavy-bodied knockdown formula is tinted for improved visibility during application and the no prime feature saves the pro time. Homax® Pro Grade Ceiling Texture technology is the latest innovation in ceiling aerosol textures. This professional tool features adjustment of pattern and vertical spray tip for ceiling application. The patented adjustable nozzle allows you to match your existing ceiling texture. The advanced water-based Pro Formula saves the pro time with a no-prime, easy clean-up technology. This time-saving tool provides portable and convenient delivery of a full range of texture patterns to achieve an invisible repair on interior ceiling surfaces. The heavy-bodied knockdown formula is tinted for improved visibility during application and the no prime feature saves the pro time. Simply spray, “knock down” with a mud knife and paint to achieve an invisible repair. Light: Up to 60 sq. ft. Heavy: Up to 30 sq. ft.
Spot prime repair area before texture application to ensure best results. Priming after texture application is no longer needed. Always practice spraying on cardboard or scrap drywall to determine preferred pattern. Shake can upside-down vigorously until ball rattles, continue to shake for one full minute before use and continuously during use. Slidered trigger lock back, away from tip. Adjust pattern: Pointing away from face, turn yellow spray tip to desired pattern: clockwise for light, counter clockwise for heavy. Spray at a distance of 6” – 18” from ceiling using a circular (not sweeping) motion and working in 4’ x 4’ sections. Apply in random pattern, covering only 70-80% of surface. Shake can occasionally throughout use. Note: Depending upon pattern setting and temperature, distance may vary. Sprays best between 70-80*F. Run can under warm water to bring to room temperature. Knockdown: Allow texture to dry no more than 1-2 minutes before lightly knocking down or flattening using a 6” or larger wet drywall knife. For best results, hold knife almost parallel to the ceiling. Note: Texture appearance will improve dramatically after knocked down. If knife drags, shorten dry time. Texture can be scraped off and reapplied when wet until desired pattern is achieved. Dry Time: Allow to dry 60 minutes before painting. Heavier textures may require longer dry time, depending upon temperature and humidity. Texture lightens in color when dry. Clean Up: Warm water. After Use/To Store: Clear nozzle by turning can upside down, spray until texture is cleared. Release trigger completely, hold can body, and slide red trigger lock to click into lock position. Test to ensure lock is properly engaged. Paint with 2 coats or more from complete hide and to match gloss (dependent upon color and paint manufacturer’s instructions).